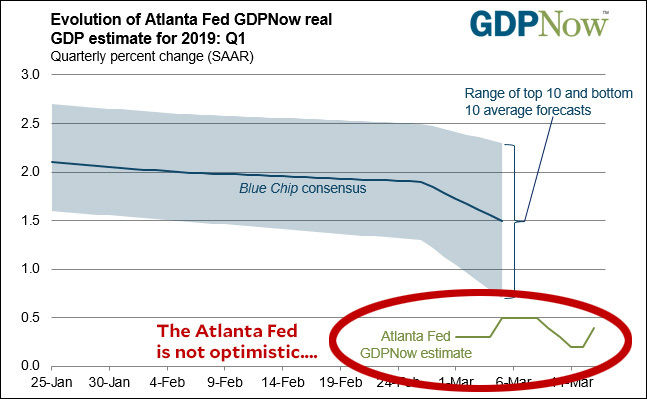 As illustrated in figure 10-16…the Administration anticipates economic growth to remain at or above 3.0 percent through 2023, assuming full implementation of the economic agenda detailed in this Report and its predecessor. We expect near-term growth to be supported by the continuing effects of the TCJA, discussed in chapter 1, as well as new measures to promote increased labor force participation and deregulatory actions, discussed in chapters 3 and 2, and an infrastructure program, discussed in chapter 4 of the 2018 Economic Report of the President, which we assume will commence in 2019 with observable effects on output beginning in 2020. Hmmm. Let’s take a look at figure 10-16, shall we? For now, ignore the fact that GDP growth in 2018 was 2.9 percent, not 3.1 percent, if you measure it the way everyone else does. 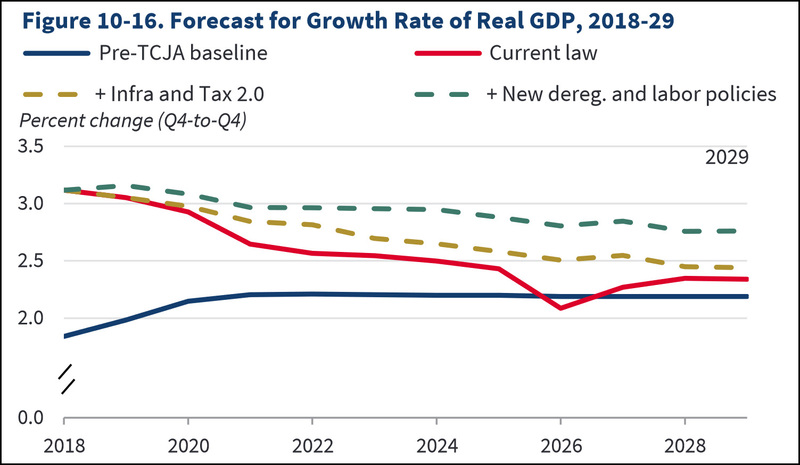 Instead, concentrate your attention on the red line, which projects real GDP growth under “current law.” It shows GDP growth of only 2.6 percent by 2021, declining to barely overy 2 percent by 2026. What happened to 3 percent growth? Funny thing about that. It turns out that Trump’s advisers have a new story for us: We could have 3 percent growth, but only if we pass a new tax cut and a big infrastructure bill and a bunch of deregulation of big business and some new labor policies. Oh, and all this stuff has to be passed in the next nine months. If it’s not, then economic growth will plummet and it will all be the fault of Democrats. I’m glad we finally got that straight. So here’s my projection: GDP growth this year and next will clock in at around 2 percent if we’re lucky, and none of Trump’s fantasies about infrastructure or taxes or anything else will have any effect on that. We’ve already gotten one tax cut for the rich, and it appears to have produced a small bump in 2018 growth and then petered out. Everyone knows it will have no further effect, even if the fantasist-in-chief insists otherwise.